UN General Assembly votes 133-12 to condemn the Syrian government, demands a political transition in Syria. The UN General Assembly on Friday overwhelmingly voted to condemn the Syrian government and demanded a political transition in Syria. 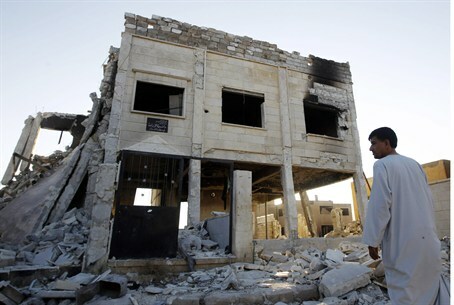 Reuters reported that the 193-nation assembly approved the Saudi-drafted resolution, which expressed “grave concern” at the escalation of violence in Syria, with 133 votes in favor, 12 against and 31 abstentions. Dozens of other countries, including many Western states, co-sponsored the resolution, the report said. As expected, Assad's staunch ally Russia was among the 12 countries that opposed the resolution in the assembly, where no country has a veto but all decisions are non-binding. Others that voted against it included China, Iran, North Korea, Belarus, Cuba and other nations that often criticize the West. Some countries did not participate in the vote. Last month Russia and China joined forces in their third double veto to strike down a Security Council resolution that would have called for an end to the violence and threatened Damascus with sanctions. Many of the elements from the latest vetoed resolution were included in the text the assembly approved on Friday. U.S. Ambassador to the United Nations Susan Rice welcomed the adoption of the resolution. “Despite the continued opposition of an increasingly isolated minority, the overwhelming majority of UN members clearly stands resolutely with the Syrian people as they seek to fulfill their legitimate aspirations,” Rice was quoted by Reuters as having said. Britain's UN Ambassador Mark Lyall Grant told reporters after the vote that a “colossal majority” supported the resolution, which had been revised to remove language explicitly backing Arab League calls for Assad to step down and urging states to implement sanctions against Damascus. Syrian Ambassador Bashar Ja'afari, meanwhile, complained that the meeting was “another piece of theater” organized by the Qatari president of the General Assembly, Nassir Abdulaziz al-Nasser, to pursue his country's agenda. The resolution was passed one day after former UN Secretary General Kofi Annan resigned from his post as the UN-Arab League peace envoy for Syria on Thursday. Annan asked that his mandate not be renewed when it expires August 31. He blamed "fingerpointing and name calling" at the UN Security Council for his decision to resign.